Unlike bees, I am terribly afraid of wasps. Don’t you agree that they have a very menacing look, like they are deliberately out to taunt and terrify? That’s what I see. 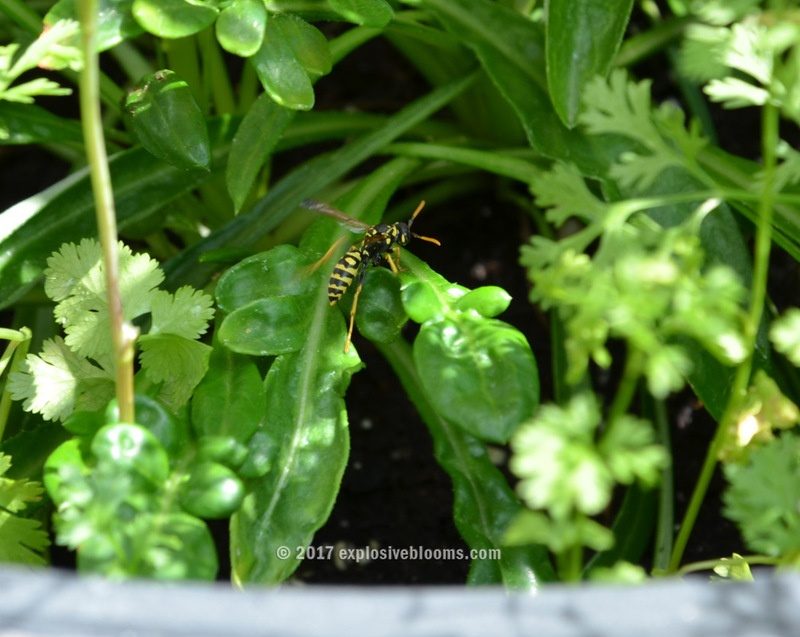 Wasps keep me out of my own garden, and I notice them in the mid-late afternoons when the sun is out and my garden is blazing hot. They seem particularly attracted to my potting table, which sounds incredibly strange. I’m not sure if it is the colour of the wood, the scent of the cedar, or the little crevices and nail holes that attract them? Or are they are scouting out my tables for their next nest? I hope not! Of course, it could be that near or on the potting tables are where colourful flowers can be found, except they still also enjoy exploring the tables. And when I say ‘they’, I am usually referring to one wasp. I don’t want to mislead you into thinking I have an army of wasps buzzing around. Yes, I usually only encounter one or two wasps in my garden at a time, but one is enough to make me run indoors. Especially the one that is visiting, that looks large and menacing, with something dangling down from it’s body. After taking photos of my newly discovered Leafcutter Bee, the wasp made an unwanted appearance. I snapped some photos from a good distance (that’s what the zoom lens is for!). This is the same wasp as the first photo. It flew from the Gazania (directly above photo) to my Habanero (first photo). I was actually worried about the tiny bee that had just visited the cilantro flowers, which is in the same pot as these Gazanias. I know that wasps are predatory, and I didn’t want this one to harm the little bee. I don’t think it did. But please take a look at this wasp. Doesn’t it look scary?? During my Leafcutter Bee research, I came across a photo of a Paper Wasp and if you compare the photo (bottom of page) to the photo of my wasp, I would say I can ID my wasp with certainty that it is a paper wasp. Paper wasps are frequently mistaken for yellow jackets, but on close examination they look distinctly different. Both are black and yellow, fly and can sting. However, paper wasps have longer bodies with significantly more black and darker wings. Their wings and waists are thinner than that of a yellow jackets and their legs hang down noticeably while they’re in flight. Yellow jackets have a smaller, fatter appearance. Paper wasps construct the familiar, open-celled paper nests we often see suspended from eaves or porch ceilings. Most species in North America belong to the genus Polistes. Paper wasps do serve an important ecological purpose as predators of other insects. They collect caterpillars, beetle larvae, and other insect prey to feed their young. Knowing this, I need to ask myself if it’s better to learn to live with a couple of them in the garden, since they do act as natural pest control, versus purchasing a wasp trap from Canadian Tire (which is actually for yellow jackets). If you were sitting across from me, you’d have witnessed a big sigh because I know what the right answer is. I need to put on my Big Girl pants and let this paper wasp go about its business, assuming it is not building a nest near my house. It’s very important to know what type of wasp you are dealing with, before you deal with it. 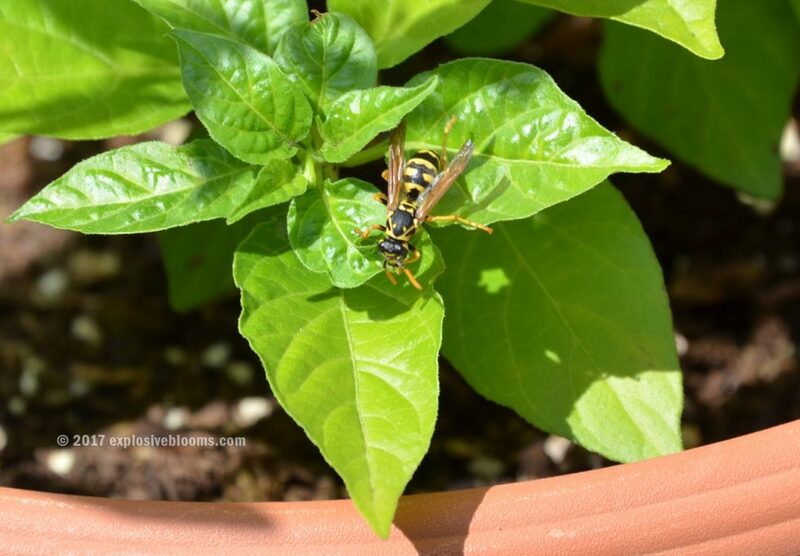 This is a short article outlining the differences between yellow jackets and paper wasps. If you have a colony of paper wasps on your property that is threatening your safety, here is information on how to control the situation. So now my question is, is this one “guy” an indication that a nest is nearby? Read this. Wasps will fly more than 6 km from their nest on their foraging trips. Naturally, you shouldn’t be alarmed unless you spot an actual bee or wasp nest.